The corpse flower (Amorphophallus Titanum) is in a flowering stage. Growing at a rapid rate of six inches per day, "Putrella" (Pew-trella) has wowed us since the tiny bud appeared mid-March. The extraordinary flower is expected to bloom in a few short weeks and, as the world's tallest blossom, could reach a height of 10 feet. 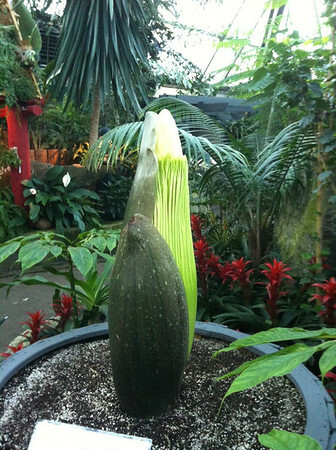 This will be first time that Western Canada has ever seen an Amorphophallus bloom.